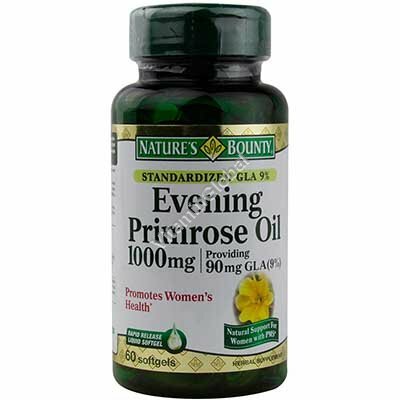 Evening Primrose is a natural source of the unsaturated fatty acid, Gamma-Linolenic Acid (GLA), that promotes women's health and helps provide nutritional support for PMS. Free Of: Artificial color, flavor, or sweetener, preservatives, sugar, starch, milk, lactose, soy, gluten, wheat, yeast, fish and sodium. If you are pregnant, nursing, taking any medications or planing any medical procedure, consult your doctor before use. Discontinue use and consult your doctor if any adverse reactions occur.